Color me excited. 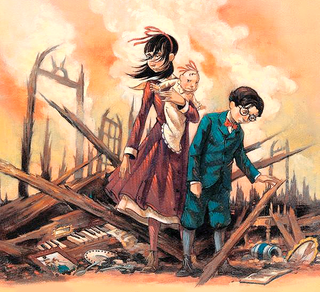 Deadline is reporting that Lemony Snicket's macabre children's series is to be Netflix latest live-action adaptation. If you're unfamiliar with the series, it follows the three Baudelaire children who, after a mysterious fire burns down their family home and kills their parents, are sent off to live with a series of colorful (by which I mean "mostly horrible") relatives, starting with their third cousin four times removed (or possibly their fourth cousin three times removed), Count Olaf. Over the course of thirteen books, things get progressively worse and worse for the children (and, keep in mind, it starts with their parents dying), because of course no one listens to children. If you haven't read the books, I strongly recommend them even to adults looking for a light read. They're truly enjoyable works, reminiscent of Roald Dahl at his best. Of course, this is actually to be the second adaptation of the series to the screen, after a 2004 movie adaptation of the first three books (they aren't very long, so the movie decided to just squish the first three on in there), starring Jim Carrey. The movie... Well, it wasn't exactly horrible, but (presumably with the casting of Jim Carrey) it decided to change the morbid tone of the books into something a bit zanier. Also, Jim Carrey is a dinosaur at one point? I don't know. The movie had a lot of good in it, with great sets, as well as a terrific performance by Jude Law as Lemony Snicket (oh, yeah, did I mention that Lemony Snicket is actually a character within the story, as well as the pen name of Daniel Handler, actual author of the series? ), but I hope that this new adaptation will stick a little bit closer to the books this time. In any case, I'm extremely excited to see what this new adaptation might hold in store for the series.